I’ve said it before and I’ll say it again. 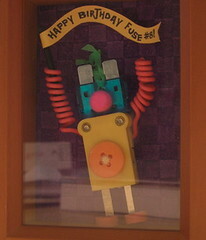 When it comes to children’s books, nine times out of ten the old phrase, “Don’t judge a book by its cover” is bupkiss. Sometimes the cover is the only reason a child’s going to pick up a book in the first place. 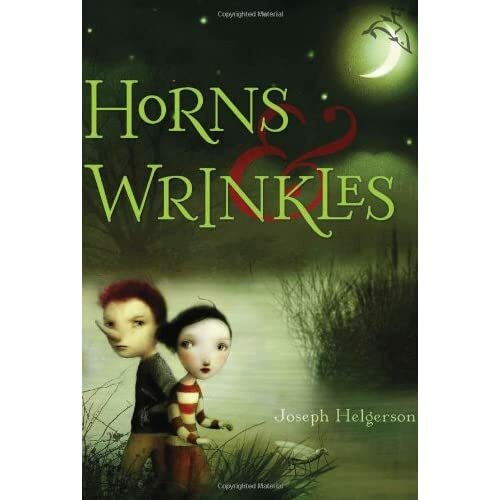 And the image on the front of “Horns and Wrinkles” . . . . well, let’s just say that more than one kid is going to find it a pretty tantalizing selection. Aside from the dreamlike quality and the subdued color scheme, there’s also the fact that it sports a boy looking directly at you while wearing a nose like a rhinoceros. But pretty covers are a dime a dozen. "How's the story? ", cry the parents of the fifth-graders who are straining to grab a copy or four of the pretty pretty book. Well, I’ve got some good news for you. This book is superb. A peach. A doll. It’s a fun American story that puts the realism back into the term “magical realism”. Add in a bunch of dreamy chapter-heading illustrations and what you have is a great little find. It’s kind of hard to pinpoint exactly when it all began, but it probably got started when that nasty boy Duke started dangling his cousin Claire off the Steel Girder Bridge just outside of town. Claire’s been the victim of Duke’s bullying for a long time now, but on this day something changed. Next thing anyone knew, Claire was sailing serenely down the Mississippi with a nice orange tennis shoe-wearing old lady and Duke had a horn growing out of his nose. Now everybody in Blue Wing, Minnesota knows that if something weird happens, it’s probably going to be river related. This part of the Mississippi causes all kinds of oddities. Everything from fairies sightings to river and rock troll incidents, and it’s no end of trouble to the town’s residents. Next thing you know Duke’s family’s turned to stone and Claire has just found herself in the company of some fast-talking nylon bicycle-suit-wearing river trolls. Now she and her cousin must help these oddly amusing critters on their peculiar quest or Duke’s family will remain stone forever. The thing is, Duke’s horn gets bigger every time he bullies someone, and worse still, he likes the change. Something is going to have to be done, and it’s up to Claire to do it. A native Minnesotan, it’s clear that Helgerson knows of which he speaks. Part of what’s so nice about this book is the fact that it feels oddly realistic. This story takes place partly in a small town where peculiar magical river occurrences are just a fact of life. One of my favorite parts in the book involved the resident sheriff, a man who’s seen it all and treats the fact that some people have been turned to stone without a blink. “There’s folks in this town that choose not to believe in fortunetelling catfish, or low-flying buffalo, or whatever . . . I’ll tell you straight out, I’m not one of them”. This is like the show NYPD done small-town, Minnesotan, magic style. The book also has a deep and abiding knowledge of what small-town life is really like. When Clair’s grandfather tells story after story of relatives who’ve dealt with river happenings, it feels natural. Like you’re on a back porch listening to your relatives reminisce about their foolish ancestors. And then there’s the fact that Helgerson just has a way with writing. There are sentences in this book like, “Tree branches remained bare but you could smell spring cooking inside them”. Or when a river troll is threatened with a most gruesome punishment, “And if there’s any funny business, I’ll turn you into books. Thick ones with no pictures and tiny print”. Thank God for humor. Thank Helgerson for filling this book with loads of it too. The characters are what really impress, though. Duke is nasty. He’s nasty on page one, he’s nasty on page 119, and he’s nasty on page 340. But it’s not as if he’s a one-note villain. Somehow or other, Helgerson has tapped directly into what makes a person a bully and has put all that knowledge into the character of Duke. He’s a coward, and a liar, but you could never say he wasn’t one hundred percent believable. The river troll trio that Claire and Duke take up with are also particularly enjoyable and surprisingly deep characters. At the beginning you get the three of them mixed up together. Then, oh so slowly, Helgerson pulls apart their personalities one by one. You begin to feel affection for Stump, a wariness of Jim Dandy, and a wariness verging on fear of Biz. The editor of, “Horns and Wrinkles” once said of the book, “One of the things I like best about the book . . . is that it's truly Americana fantasy. I just can't think of too many other books for this age group that happen right here in the US of A”. And boy has she got THAT right. Name the five best American children’s works of fiction that were published this year. Go on. Name ‘em. If you’re anything like me you started scratching your head at some point and muttering under your breath, “Does ‘Fly By Night’ count? No, that’s British”. The fact of the matter is that American fantasies are rare shy little beasties. When someone wants to make a truly interesting tale for kids with roots firmly embedded in the soil of North America, you could end up with anything from Michael Chabon’s, “Summerland” (an underrated title, if you ask me) or Diane Duane’s, “So You Want To Be a Wizard”. The nice thing about “Horns and Wrinkles” is that it’s a truly Midwestern creation. The book is set between the Minnesota and Wisconsin bluffs in the whirling twirling currents of the mighty Mississippi. Ya can’t get more Yankee than that! The book isn’t perfect, of course. Often I’d find myself a bit furious with Claire for continually helping out her cousin, even though it was obviously a bad idea. Helgerson justifies these multiple lapses in judgment in a variety of different ways, but never so much that they don’t feel a little convenient. I mean, if Claire didn’t keep following Duke hither and thither then this would be a very short story. Still, Duke uses his cousin again and again and she only gets back at him with little growls and sniping comments. Grow a backbone, girl! In the interest of full disclosure, I should mention that “Horns and Wrinkles” won my heart lock, stock, and barrel when the appearance of a long-lost relative is explained away by a character saying, “We’ll say he’s a cousin visiting from Kalamazoo”. Yay, my hometown! Also, the small illustrations by Nicoletta Ceccoli are worth the price of the title alone. All in all, if you find that you have to purchase a new fantasy title for the kiddies and you’d like to eschew the usual British tales that say, “Book One In An Exciting New Series” or words to that effect, this is the one to nab. This is not to say that a sequel to "Horns and Wrinkles" would not be more than welcome. But when it comes to rock solid writing and amusing details, this title stands on its own two feet.